See how campaigns are performing at a macro level across all clients. Our real-time agency dashboard shows agency call volume, cost, revenue, and campaign performance so that they can quickly spot issues and drill down by client view. Send call data into top marketing and analytics platforms through integrations with Google Analytics, Google Ads, Salesforce, Marketo, HubSpot, and more. 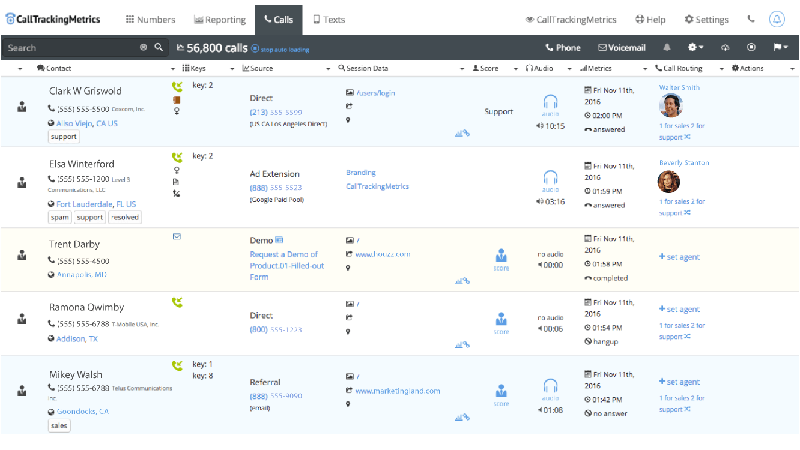 Customize agency call tracking reporting to be consistent with your agency’s communication cadence and the preferences of your customers. Provide the level of detail that your clients need to understand the performance of their campaigns. You control the frequency, the content, the recipients, and white label the look and feel of the reports with your own branding. We offer a complete affiliate program for partners that wish to take a more hands-off approach. We provide a unique affiliate link that is yours to share. As customers sign up, you earn 10% of their total spend across the lifetime of the account. This is a great way to provide value to your clients without having to actively manage their accounts day to day. Contact us to find out firsthand why more than 30,000 customers trust us for their call tracking and call management needs.